An International Monetary Fund study published on Tuesday showed that Greece needs far more debt relief than European governments have been willing to contemplate so far, as fractious parties in Athens prepared to vote on a sweeping austerity package demanded by their lenders. The IMF's stark warning on Greece's debt came as Prime Minister Alexis Tsipras struggled to persuade deeply unhappy leftist lawmakers to vote for a package of austerity measures and liberal economic reforms to secure a new bailout. In an interview with state television, he said that although he did not believe in the deal, there was no alternative but to accept it to avoid economic chaos. The IMF study, first reported by Reuters, said European countries would have to give Greece a 30-year grace period on servicing all its European debt, including new loans, and a dramatic maturity extension. Or else they must make annual transfers to the Greek budget or accept "deep upfront haircuts" on existing loans. The Debt Sustainability Analysis is likely to sharpen fierce debate in Germany about whether to lend Greece more money. The debt analysis also raised questions over future IMF involvement in the bailout and will be seen by many in Greece as a vindication of the government's plea for sweeping debt relief. A Greek newspaper called the report, which was initially leaked, a slap in the face for Berlin. Late on Tuesday, a senior IMF official, who spoke on condition of anonymity, said, "We have made it clear ... we need a concrete and ambitious solution to the debt problem. "I don't think this is a gimmick or kicking the can down the road ... If you were to give them 30 years grace you are allowing them in the meantime to bring down debt by ... getting some growth back." German Finance Minister Wolfgang Schaeuble said in Brussels on Tuesday that some members of the Berlin government think it would make more sense for Athens to leave the euro zone temporarily rather than take another bailout. The Greek Finance Ministry said it had submitted the legislation required by a deal Tsipras reached with euro zone partners on Monday to parliament for a vote on Wednesday. Assuming Athens fulfils its end of the bargain this week by enacting a swathe of painful measures, the German parliament is due to meet in a special session on Friday to debate whether to authorise the government to open new loan negotiations. "The dramatic deterioration in debt sustainability points to the need for debt relief on a scale that would need to go well beyond what has been under consideration to date - and what has been proposed by the ESM," the IMF said, referring to the European Stability Mechanism bailout fund. An EU source said euro zone finance ministers and leaders had been aware of the IMF figures when they agreed on Monday on a roadmap to a third bailout. In the interview on Greek state television, Tsipras defended the deal he signed up to, saying it was better than the alternative of being forced out of the euro zone. He said banks, closed for the past two weeks to prevent a flood of withdrawals that would collapse the banking system, would reopen once the deal had been fully ratified by parliaments in Greece and other European countries. Tsipras could not conceal the bitterness left by last weekend's acrimonious euro zone summit. "The hard truth is this one-way street for Greece was imposed on us," he said. Lawmakers from his ruling Syriza party and their allies argued behind closed doors about whether to back sweeping reforms the government must ram through parliament as it races to meet the terms of the bailout deal. A poll in To Vima newspaper showed that more than 70 percent of Greeks believed there was no alternative to a deal and that parliament should pass it. Having staved off a financial meltdown, Tsipras has until Wednesday night to pass measures tougher than those rejected in a referendum days ago. With as many as 30-40 hardliners in his own ranks expected to mutiny, Tsipras will likely need the support of pro-European opposition parties to muster the 151 votes he needs to pass the law in parliament. Speculation has grown that the fractures caused by the bailout will be too much for the government to bear and Tsipras will be forced to step down. But he appeared to rule out an early exit or forming a national unity government with opposition parties. "The worst thing a captain could do while he is steering a ship during a storm, as difficult as it is, would be to abandon the helm," he said. He gave no explicit indications of plans for a cabinet reshuffle, saying only that his priority was restoring stability and that party matters could wait. Syriza and its right-wing nationalist junior coalition ally held separate meetings to prepare for parliament sittings to pass the laws, which include plans for tax hikes, pension reforms and tighter supervision of the government's finances. It was a spectacular turnaround for a Syriza party voted into power in January promising to end years of cuts and recession in a country where one in four people is unemployed. In Germany, the biggest contributor to euro zone bailouts, doubts lingered about whether Tsipras would stick to his word. "There are many people, including in the federal government, who are quite convinced that in the interests of Greece and the Greek people that what we wrote down would have been much the better solution," Schaeuble said when asked about a German proposal on a "time-out" for Greece from the euro zone. The Syriza party's junior coalition partner promised support, with the ambiguous caveat that it would only vote for bailout measures agreed before last weekend's summit in Brussels, which were less stringent. Opponents of the new measures plan strikes and protests in the coming days. "I've taken the decision, this is a tough third bailout and I will not vote for it," Despoina Charalambidou, a deputy parliament speaker and Syriza lawmaker, told Vima FM radio. "Why should I resign? I was elected on the basis of a certain manifesto, the Syriza programme, which support these positions. I'm not giving up my seat." Another obstacle could be parliamentary speaker Zoe Constantopoulou, who is key to the logistics of the vote and has been one of the creditors' most ferocious critics. Tsipras could try to force her out through a no-confidence vote but that would eat up precious time and political capital for the reform bills. Austria's Chancellor Werner Faymann said a "Grexit" could not be ruled out despite the agreement, echoing findings by a Reuters poll of 60 economists, some of whom saw at least a 50 percent chance of Greece leaving the currency. The poll, which was carried out in the 24 hours after news of the agreement broke, also pointed to scepticism about whether the deal was good for both Greece and Europe, and whether Greece had enough assets to sell to meet the terms of the deal. Euro zone finance officials must find a way to give Greece bridge financing to keep the country afloat while the third bailout package is negotiated, especially to pay back loans owed to the European Central Bank that are due next week. There has been mounting anger at the government and creditors as many Greeks decry what they see as the humiliation of their country being treated like a European colony. The pain for Greece continued, with strict controls on withdrawals from cash machines and businesses being squeezed dry. 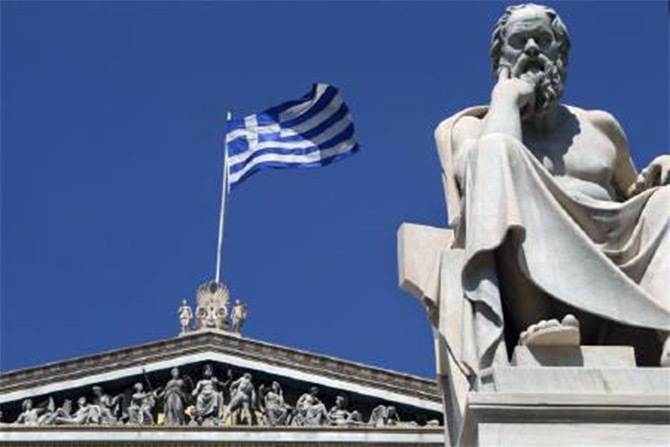 A Greek trade federation called on the government to loosen capital controls to allow companies to make payments owed to overseas vendors, and pharmacists warned they were having difficulties getting supplies.